I quite like yesterday’s Knitting peace post in the Sand gets in my eyes blog. I completely agree that knitting can foster peace on many levels. These range from the calming and meditative effect it has on me personally (particularly in the more intense activist and political meetings I attend), to the larger social impacts groups like the Revolutionary Knitting Circle strive for. 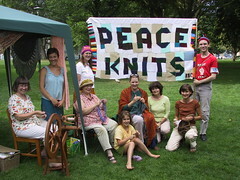 knit, knitting, RKC, Revolutionary Knitting Circle, peace, Peace Knits.